Queens Library lets users check out a necktie for up to three weeks to wear to job interviews or other important events. It's common knowledge that your local library is the place to check out books, DVDs, and even sheet music. 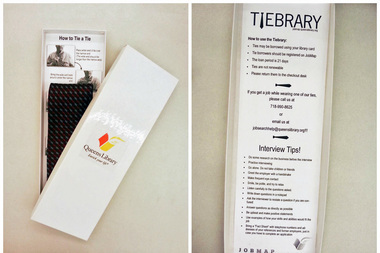 But four Queens Library branches offer a more unusual lending system: a "Tiebrary," where patrons can use their library cards to check out a necktie for up to three weeks to wear to job interviews or other important events. The program was launched a couple of years ago to aid customers who would come to the library for help applying to jobs or doing video interviews, who either didn't own a tie or didn't realize they needed one until the day of an event. "Maybe they had a nice shirt, but they didn't necessarily have a tie," said Tara Lannen-Stanton, the assistant director of Queens Library's Job and Business Academy, who pointed to similar work-attire programs aimed at women. "There isn't necessarily as much out there for men." There are "Tiebraries" at the Central, South Jamaica, Arverne and Laurelton Queens Library locations. The ties — which the library receives through donations — come in boxes complete with illustrated instructions on how to tie a standard half-Windsor knot, as well as a list of interview tips. They can be borrowed for 21 days or even worn inside the library for customers doing a Skype or video interview. The program is just one unconventional way libraries are looking to serve the public, Lannen-Stanton said, who pointed to other programs like seed libraries that let gardeners borrow and swap seeds. "Libraries are loaning out all sorts of things that aren't books...But we were the first, as far as we know, to lend out ties," she said, adding that the Philadelphia Library modeled its tie-lending program after theirs. Queens Library's Business and Job Academy offers a number of other career services, including job search and resume help, computer and technology classes, assisting with business proposals as well as training people to work in fields like security or home healthcare. There are 14 locations that offer the specialized Business and Job Academy programs, and the resources are open to anyone. "All of our services are open to all," Lannen-Stanton said. "We really try and make the Job and Business Academy staff available as much as possible to as many people as possible."